Anyone would feel as Lucky As Can Be to receive this Gift In A Jar! Happy Monday, everyone! I am so excited to tell you that I am a new writer for the eHow craft blog. I will be sharing crafty tutorials on the eHow craft blog and to keep you up-to-date, I will be sure to share a link here. In my very first craft tutorial, I decided to go with one of my favorite things: a gift in a jar. Since St. Patrick’s Day is just around the corner, I went with mint flavored items in a green and gold theme. The Lucky As Can Be gift in a jar can be given for the holiday, or you could give it to a friend who needs a little good luck! Come on over, say hello, see what is in the jar and download the free printable gift tags. I’m enjoying your posts, however the eHow links are failing, and if I can find the pages, they don’t print properly, the search container repeats on every page, often hiding key information. Hi. LOVE your canning jar ideas. This one is very clever however memories of having eaten a whole chocolate mint cake covered with 7 minute icing at age 13 still resonate in my head so the choco-mint combo is not for me. BUT it suggests a “For Chocolate Emergency” theme that has a positive ring to it. I’m going to run with that theme for gifts for my girlfriends for the holidays. Thanks so much and have a great holiday! CONGRATS on your new position at eHow!! That is so exciting! I love this gift in a jar idea! Genius! 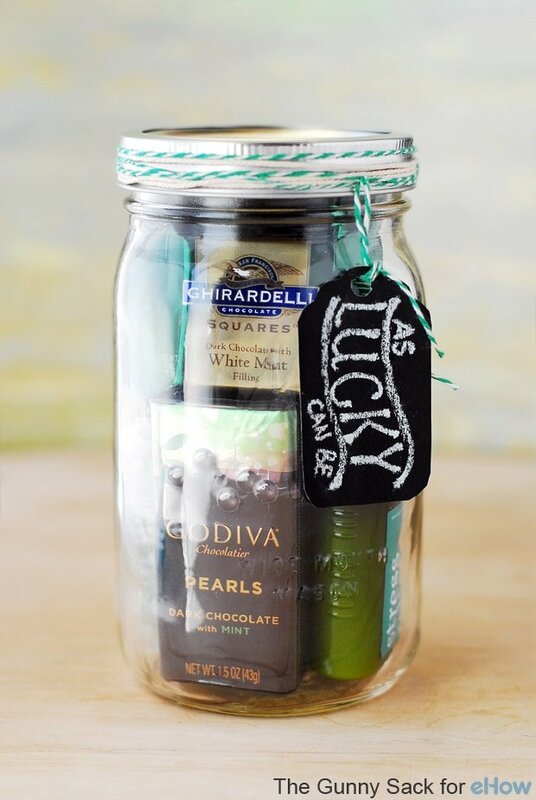 Another fabulous gift in a jar idea! LOVE! !